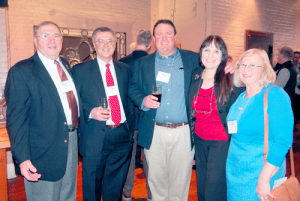 Brown’s Brewing, Revolution Hall, Troy, NY, provided the perfect setting for New York Farm Bureau’s 2019 Feast-East fund raising event, where folks came together to socialize and support the Foundation as the educational arm of NYFB. Keynote speaker Richard Zwirn has been a school counselor for 24 years at Greenwich Central School. He remarked that the people involved in ag are real and passionate about what they do, with huge amount of diversification in employment including some of the most educated and intellectual people, as with research scientists, veterinarians and engineers. “It’s just vast, and I can find someone in any grade and any classroom that would be perfect for one of many, many, many avenues or paths in the industry,” he emphasized. Zwirm left attendees with a bit of advice. Sandra Prokop, Managing Director of the NYFB Foundation for Agricultural Education at New York Farm Bureau, says it is good to see that the NYFB group is growing. The annual Feast is a major fundraiser for the Foundation. For more information on New York Farm Bureau Foundation resources, data or programs, contact Prokop at sprokop@nyfb.org.